In 1902 a permanent police station was built on the small hill next to Tai O Ferry Pier, to reinforce the police forces on Lantau Island. As one of the earliest police stations on the outlying islands of Hong Kong, it was established to combat pirates prevalent in the neighbouring waters. Yet, the policemen's lives did not centre around crime as such, rather, it served as an administrative centre. The police had quite a community role of the rural setting in Tai O. They were brought in to help with family disputes and arguments between villagers. Officers of the Old Tai O Police Station were under the charge of the marine police and they were mainly responsible for the public security of the villages in Tai O and they patrolled within the community by means of sampan. Due to the declining crime rates, the police station ceased to operate and functioned as a patrol post from 1996 to 2002. Its restoration came in 2009, when Hong Kong Heritage Conservation Foundation Limited was selected to undertake its revitalisation under Batch I of the Development Bureau's Revitalising Historic Buildings Through Partnership Scheme. 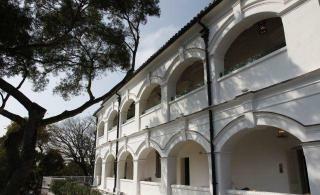 This involved its conversion into a nine-room boutique hotel, the Tai O Heritage Hotel. In 2010, it was graded as a Grade II historic building by the Antiquities Advisory Board.